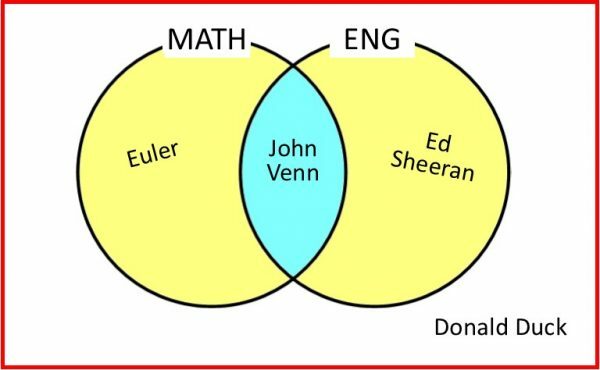 John Venn did not invent the Venn Diagram (the original idea was Euler’s). But he is famous for popularising the diagram which now takes his name. Mathematicians are always looking for ways to make abstract ideas easier to picture – like the Number Line for “picturing” numbers, or the Bar Chart for picturing data. 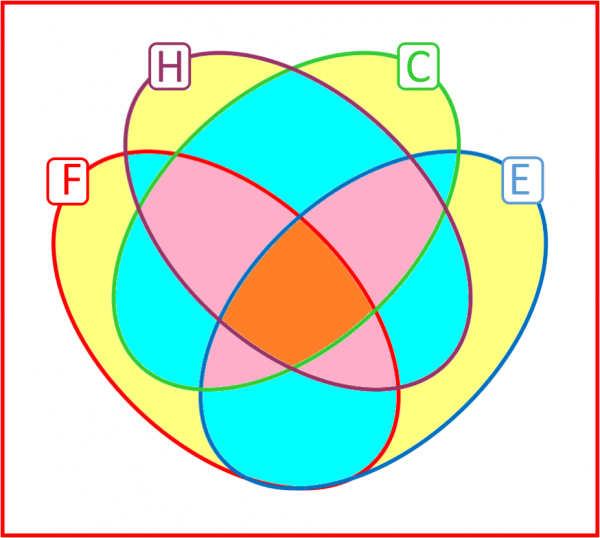 Venn Diagrams are a beautiful way to organise groups, or “sets” of objects. John Venn, zebra, cat, octopus, tripod, chair. 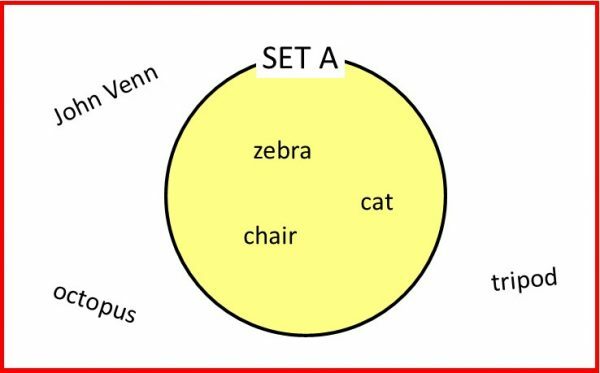 Zebra, chair and cat have exactly four legs each, and so they go inside the circle. But John Venn (2 legs), tripod (3 legs) and octopus (either 8 legs, or 2 legs + 6 arms, depending on who you ask!!?!) go outside the circle. 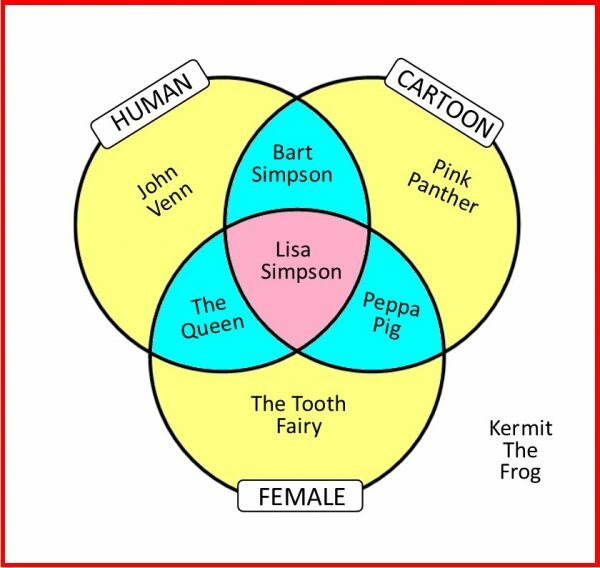 John Venn – being both English and a Mathematician – goes in the INTERSECTION (“overlap”) of both circles (as would Isaac Newton if we wished to place him in this diagram). Euler, being a Swiss not an English mathematician, is in set MATH but not ENG; Ed Sheeran is English but not a mathematician so goes in set ENG but not set MATH; and Donald Duck, a non-English non-mathematician, is around the outside. For clarity, I’ve coloured the intersections of each pair of circles blue, and the intersection of all three circles pink. Although the diagram only features one character in each region, you could place any character somewhere on the diagram. Which region would you go in? And if you are with 7 or more friends, see if you can design a different Venn Diagram with three qualities so that each region has at least one of your friends in it. I had lots of fun designing this one! This time there are 16 (=2x2x2x2) different regions to fill, so I’ll leave you to find characters for each region! With every additional quality, the number of regions doubles again – so a 5-curve Venn Diagram will have 32 different regions. To see why this is, imagine you wanted to add another quality, say “have they ever appeared on a UK postage stamp?” In the new diagram, each of the previous regions must be combined both with and without the new quality, meaning twice as many regions in the new diagram. Back to the 4-curve Venn: how many of the regions are inside 0, 1, 2, 3 and all 4 curves? I’ve coloured them differently to make it easier to count that there are 1, 4, 6, 4, 1 such regions respectively. Fans of Pascal’s Triangle will recognise this famous sequence! 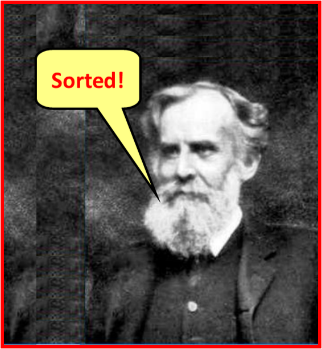 FINAL THOUGHTS: John Venn lived from 1834 – 1923 (Wow! – maybe maths makes you live longer?). He was originally a priest before becoming a full time mathematician (someone who likes numbers, shapes and patterns), philosopher (“Who made God?”) and logician (true or false? : “This sentence is a lie”). He was married to Susanna and had one son: also John Venn (which must have made sorting his mail difficult). He was a keen supporter of votes for women, and won prizes for his home grown vegetables.